Breach & Clear. Mmm, sweet movement lines and cover symbols and area of coverage indicators. I played the second Rainbow Six title, Rogue Spear, more than any game before it. 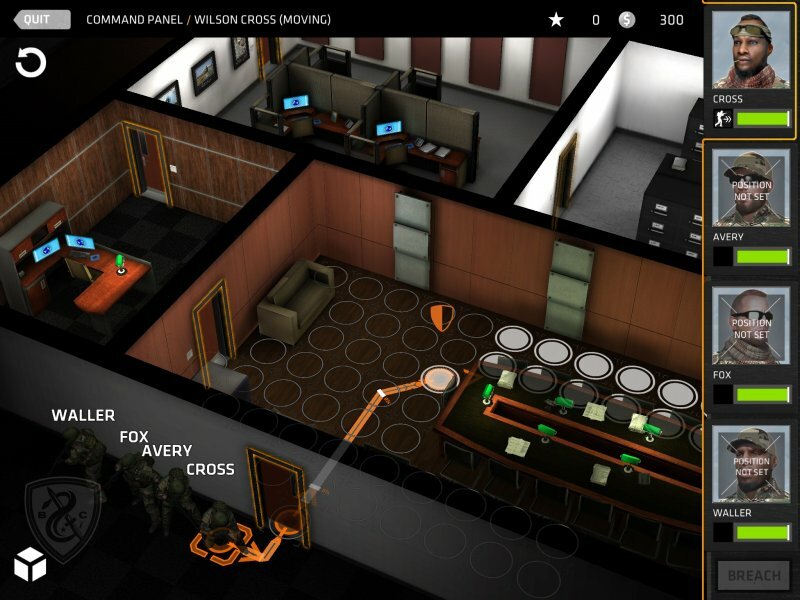 The game was split into two parts: first you planned your assault on a terrorist-held location in minute detail, outlining every operative’s path and angles and use of weapons and equipment on a second by second basis through the whole operation. This was a very involved process thanks to a not very user friendly interface. Then you played out the operation, controlling one of the operatives in first-person, which was the phase I always dreaded as it called for very quick reflexes and absolute confidence in the plan, even if it always went out the window at some point. But the satisfaction of a clean, successful operation was something no other game in the same vein has been able to offer ever since. SWAT 4 and the original Ghost Recon gave you some of the same kicks, even though without the tactical pre-planning. The properly tactical shooter has been dead ever since, the subsequent Rainbow Six and Ghost Recon titles going for out and out gunplay, completely losing sight of what made them great to begin with, but now the tactical shooter is making a comeback thanks to the promising Takedown. While waiting for Takedown we have an interesting smaller game to delve into: Breach & Clear takes the tactical planning part of Rainbow Six and turns it into a full iOS title. You take control of a real-world special forces team and hit a sequence of realistic, small locations to, well, breach and clear: enter and take out all the hostiles. You’re given all the tools you would expect, save for off-site sniper support, which is a somewhat puzzling omission. You plan the action turn by turn, each turn giving you enough time to clear roughly one room, moving your four soldiers and hitting the “go” button to see how it plays out once you’re happy with the plan. Anticipating enemy locations and getting the first shot in are paramount. When that isn’t possible, you need to come in from several angles at the same time or utilize tools like flashbangs. This leads to the game’s one design problem – it needs a way to control time. Rainbow Six had the idea of assigning “go” orders to chosen moments. The soldiers would wait until you gave the correct code, allowing you to stack up on multiple doors to a room and going in at once. Without this you’re essentially eyeballing to try and get guys to move in a synchronous fashion. It’s just about acceptable as you can imagine that after the initial breach (which kicks off every scenario) a team would move through a target as fast as they can, relying on initiative to see them through. But as a player, it feels like I’m missing a tool. Another issue has to do with the way the campaign is laid out. Your main motivation is amassing money to customize your gear with a large array of real-life options. There isn’t enough information on the options to really make it appealing, though, and the cumbersome user interface gets in the way. There is also an in-app purchasing system. Based on my time with the game, it doesn’t look like it upsets the game balance, but it’s a little hard to tell because of lack of feedback and transparency in the game mechanics. There appears to be a nice selection of attributes that affect the outcome of a confrontation, but you’re never told how they add up. Is mobility more important than reaction time? What about accuracy? How does movement and cover affect things? It all looks like the kind of tactical system I would design for this kind of game, but as you’re never really told how it all hangs together, it feels vague. My biggest gripe with the game is responsiveness. From the time it takes to load on an iPhone 4S – and I understand this is primarily a tablet game – to the fiddliness of the buttons – it’s often unclear whether I hit a button or not – I spend too much time fighting the game to get things done. The “cancel” button sees a lot of use due to not managing to hit the correct grid coordinate when planning your moves or rotating your guys. (And how exactly do you cancel grenade throws?) When you do have everything lined up as you’d like, the action leaves too much in the dark. You’re not shown when your guys engage or spot hostiles; it’s up to you to align the camera so that you can see what’s going on during your action phase. So there’s a bit of a learning curve to gettings things done and experimenting blindly is never that much fun, but the core action works so well that I can’t help but spend time on improving my grades and boosting my soldiers’ stats. Recommended, if you already know you’re into it, but without prior exposure to this sort of game, I imagine the shortcomings get in the way of enjoying it.